Now through June 22, you have the opportunity to see Maya Lin's exhibition of New York-inspired sculpture at the Pace Gallery at 32 East 57th Street. The show, titled "Here and There," focuses on Lin's interest both in geographical forms and the pressing issue of climate change. Most of the wall-mounted sculptures depict New York or New Jersey rivers or coast lines. Especially evocative is Pin River Sandy, which uses hundreds of steel pins to show the flood plain following last year's devastating hurricane. 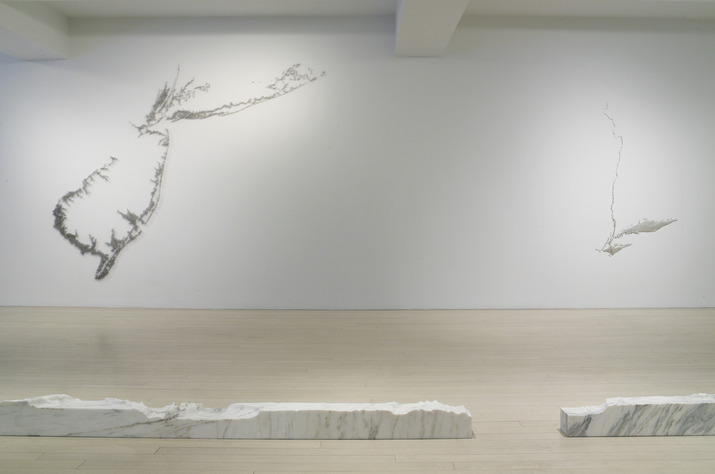 Nearby, Lin uses recycled steel to show the Hudson River; the surrounding white wall becomes the land, throwing the the rivers contours into sharp relief. This is a small show--other than the video memorial What is Missing?, it fits in one room--which gives you time to study each of the works at leisure. For those interested in cartography, nature, and the intersections between map-making and art, this show is well worth a visit. The gallery is open Tuesday-Friday, 9:30am-6:00pm and Saturday, 10:00am-6:00pm.